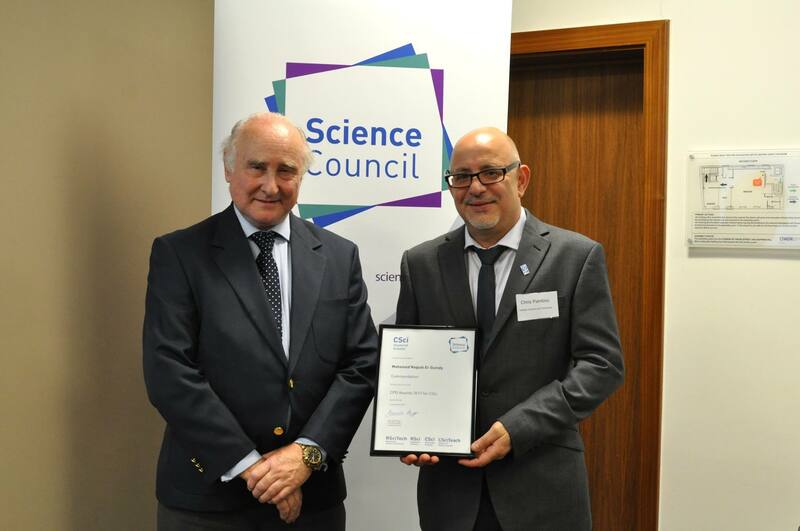 On 21 September, winners of the Science Council’s CPD Awards were invited to a ceremony in London to celebrate their achievements. The annual CPD Awards is designed to celebrate the continuing professional development (CPD) efforts and achievements of registrants from across the registers: Registered Science Technician (RSciTech), Registered Scientist (RSci), Chartered Scientist (CSci) and Chartered Science Teacher (CSciTeach). Now in its third year, the awards offer them recognition for their broad and diverse range of professional activities. It’s honor to be among the winners and commended members of the professional institutes that received the awards from the Science Council. I would like to thank the Institute of Science and Technology (IST UK) for all the support and nomination and it means a lot in terms of professional career to be recognized by the Science Council as Chartered Scientist and also commended for my CPD in 2017. Below is my certificate received on my behalf by staff member of IST UK and Professor David Croisdale-Appleby, Science Council Chair (left) as I wasn’t able to attend the ceremony due to my travel with the UN.